Foliage Day 2016 - The tradition is one of many years and the importance of Foliage Day is much greater than the anticipation, surprise, and day off from classes. Foliage Day is about the whole school–students, faculty and staff–participating in something together, and taking time outside of our busy days to appreciate our special community. New Hampton School supports a number of co-curricular and extra-curricular offerings for students to pursue their passions, discover new hobbies, or try something they are interested in pursuing. Some activities have formal time set aside during a co-curricular season, other's meet during independently scheduled time throughout the year. Art After School is a winter co-curricular offering that allows students passionate about the arts extended access to the art studio and classrooms. Students are also supported by faculty in the Art department so guidance and assistance is available as needed. The Dance Program is offered as a winter co-curricular and students practice dance daily in the Lane Dance Studio. Dance style is contemporary and varied depending on the interest of the students and expertise of the instructor. Over the three-month winter season students put together a performance that is then shared with the school community. The Farm Team is a fall co-curricular offering. Students meet in the greenhouse each afternoon and work on various food production activities. These include: planting and harvesting greens and other vegetables for use in the dining hall, managing compost areas, watering, weeding, and mulching. The group also visits local farmers’ markets and volunteers at a local small scale dairy farm. The GSTA mission is to be a safe, inclusive place to connect with others and educate members and the community about LGBTQ+ topics. The group meets bi-weekly throughout the school year, with additional meetings as necessary. The GSTA has presented in School Meeting for national events such National Coming Out Day and MLK Jr. Day; designed and produced a Rainbow Husky sticker for distribution; taken ownership of The Gratitude Tree in the Dining Hall; attended conferences; hosted a movie night, and more. Students involved in the Health and Wellness Council work closely with the members of Health Services to support the health and wellness of the student community. This group educates the school community about healthy decision-making whether with regard to food choices in the dining hall, exercise and activity, or stress relief. In the spirit of student leadership and responsibility, NHS uses a student proctor system to help faculty members manage houses, to provide student leadership on campus, and to assist younger and/or newer students in transitioning to the challenges of daily life at a boarding school. Proctors are selected through the School Life Office and house parents, and participate in training before school starts and ongoing during the year. In addition to modeling good citizenship, healthy habits and choices, and working with house parents, proctors assist students with personal and/or school-related challenges. Proctors also contribute to the governance of the school and participate in the School Life Curriculum programs. The Husky Green Council (HGC) is a group of students, faculty, staff, and administrators that are dedicated to a sustainable school, community, and world. Members of the HGC provide education, leadership, and change toward a life that is sustainable. Husky Tour Guides are student ambassadors that volunteer time in the Admission Office. Their primary responsibility is to welcome and tour prospective families. In addition, Husky Tour Guides help the Admission Office with prospective student communication and host students during spring revisit days. The Literati is New Hampton School's literary magazine. The Literati maintains a website and produces an annual magazine with writing, poetry and imagery produced by students at New Hampton School. It also creates opportunities, contests and events to share their enthusiasm for literature and the arts with the school community. The Math Club meets during winter co-curricular activity time. Students work together and independently on mathematical problems. They further their understanding of math and think about real world problems through a mathematical lens. Occasionally, the Math Club has opportunities to attend competitions and test their skills and understanding against other students their age. Model UN is an elective student group that participates in local and national Model United Nations events. Participants learn about diplomacy, international relations and the United Nations. In simulated experiential conferences, students develop skills for debate, diplomacy, research and public speaking. Music after School is a winter co-curricular offering that allows students passionate about music extended access to the music studio. Under the supervision of Director of Music, Kyle Masterson, students develop songs and skills to share their music with the community. This also allows additional practice time for students working on music performances. The Outing Club meets during spring co-curricular activity time. The Outing Club explores a range of outdoor activities including hiking, rock-climbing, fishing and mountain biking. 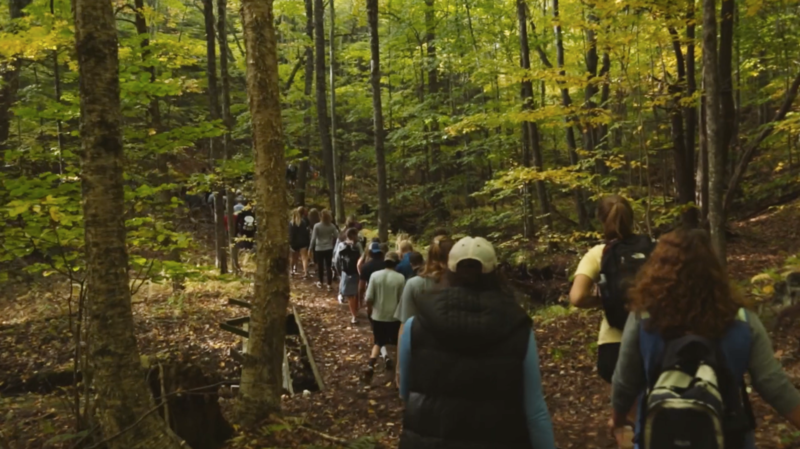 Students who are passionate about the outdoors have access to a fantastic selection of outdoor activities due to New Hampton's central location in the heart of the lakes region and just south of the White Mountains. Students who participate in the Spring Musical production dedicate their spring co-curricular activity entirely to the performing arts. The production is complex and professional. Students commit to extensive time and study of the chosen performance, culminating in one school-wide and one public performance late in the spring. Student Council is a student group advised by a faculty member and let by the student body president and vice president. Elections for student council members are held each spring and fall. Each class elects a class president and two class representatives. With the help of the faculty class deans, the student council members are responsible for running class meetings, building school spirit, advancing the efforts of their class, and participating in the governance of the school. The Theater Tech group studies technical theatre including lighting, sound and design, and supports programs held in the school's McEvoy Theater. Theater Tech students provide technical support for twice-weekly School Meetings in addition to Community Meetings and special events in the theater throughout the year. The Yearbook group meets daily during the fall and winter co-curricular season and designs the school's annual yearbook. Students learn layout and elements of design. They also have an opportunity to get to know more about their peers and school programs through identifying photos and remembering school events. Yoga is offered at New Hampton School as a spring co-curricular. Over the course of eight weeks, students learn the basics of yoga through physical postures, breathing exercises, and relaxation techniques. Students are also exposed to different styles of yoga and meditation in order to learn ways of increasing their strength, flexibility and overall well-being. A full life is afforded students through participation in academic and co-curricular activities, so their leisure time is of prime importance. The students on the Student Activities Council, facilitated by the Director of Student Activities, devote their efforts to providing creative and engaging outlets on weekends and other free times of the year. Past on-campus weekend activities have included a hypnotist, live bands, a talent show, and movie nights. Off-campus activities include local hiking expeditions, rock-climbing, bowling, or student-choice trips. Winter Carnival and Spring Fest are closed weekends in February and April, respectively, offering two days of fun activities and games. Students are encouraged to speak with Student Activities Council members or the Director of Student Activities about ideas and opportunities. New Hampshire is full of fun opportunities for people of all ages. Below are some of the varied activities we have offered to students in the past.